Do you hear that skippetty thump thump? I’ve been working on a new eBook for more than 6 months and I have FINALLY finished it! I’ve designed a slew of wonderful necklaces, bracelets and pins that are just sooooooooooo neat! 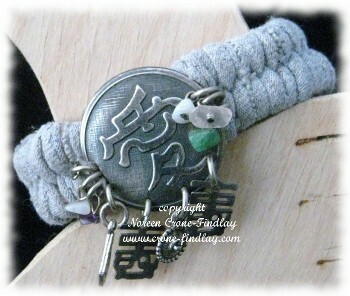 Some of them, like this bracelet, are woven with t shirt yarn, so woots! 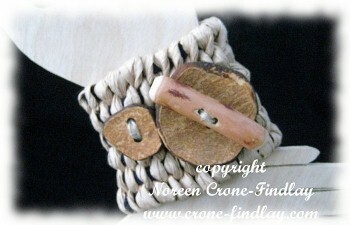 You can be super eco friendly and upcycle and recycle at the same time as weaving and wearing fab jewelry! You can use all kinds of yarns, cords, threads, fabric strips, paper ribbon- you name it…. 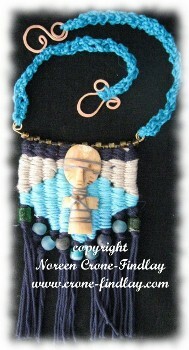 I love weaving jewelry, and hope that you will, too! 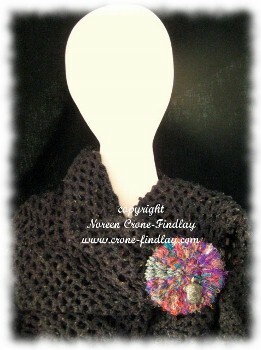 So scoot on over to my website, and see more pics and order the book, and start weaving! 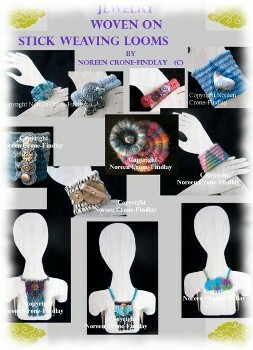 Just checked out your website too – amazing creations with the weaving sticks! Beautiful and creative ideas. I love all the different shapes you were able to make. Noreen, your imagination never ceases to amaze me! These are just wonderful and fun. Thank you so much for sharing your ideas with everyone. Wow! Stunningly gorgeous creations. You’ve done it again! What size weaving sticks do you recommend? I used a couple of sizes of weaving sticks in this book: The Lee Valley weaving sticks (from Lee Valley.com) are wooden and are 1/4 inch in diameter and 6 1/2 inches long. I also love the Clover weaving stick loom (from Lacis.com). The metal weaving sticks in the Clover loom are about 1/8 inch in diameter.